This piano fallboard lock from Jansen will secure your piano from unwanted playing. The large lock is also a visual deterrent. These locks are often used by schools, churches, and hotels for pianos in public rooms and auditoriums. The lock includes 2 brass keys and an installation kit for a custom fit. 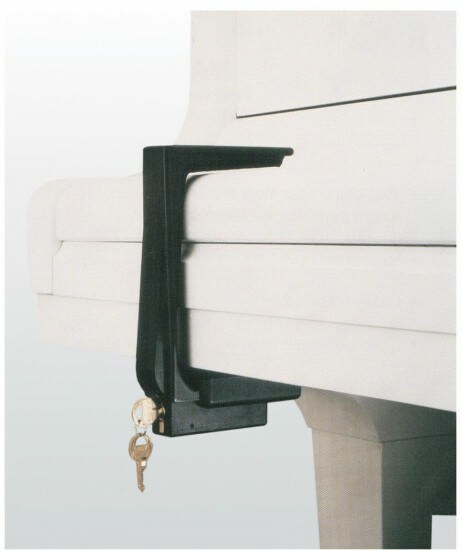 The lock fits nearly all grand pianos and most upright pianos. The opening is 6″. Secure installation requires only a screwdriver, but if you are not comfortable, a technician will be happy to install this for you.